I've always enjoyed reading women's birth stories, but have never attempted to write up my own. I think my hesitancy in writing them is because of my disappointment in my birth experiences. I know, I have three beautiful and healthy children, and for that I am extremely grateful. Yet there is still a part of me, even four years after Blaise's birth, that morns for the natural birth experience I never had. But in keeping with the spirit of the 7 Posts in 7 Days Challenge, it's time to get these stories written! I always imagined that I would have a completely natural birth. We'd labor as long as possible at home and then check into the hospital and use one of the jacuzzi suites for the remainder of the labor. When it came time to push, I wanted to do so in a squatting position. I was not to be offered medication under any circumstances. We had a simple and well written birth plan and I'd filled out all the forms stating our preferences for the hospital staff. 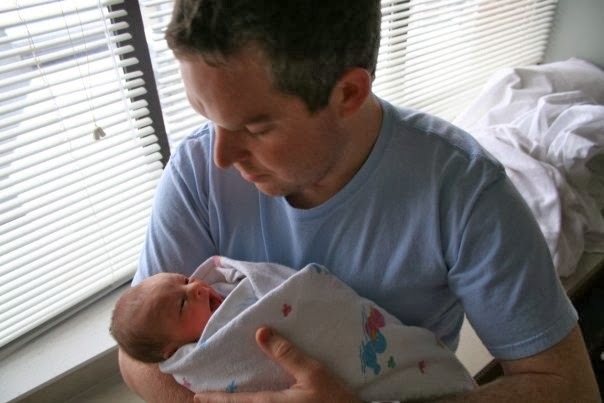 I knew many people who raved about the benefits of natural child birth and being very medicine-adverse myself, knew this was the best approach for me. I had no reason to doubt that my plan would work. My mother had been able to birth me naturally even though I was breech! 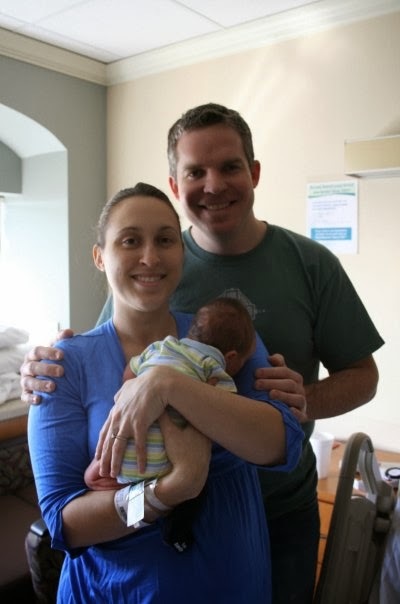 Some of my friends and family had delivered enormous babies naturally. 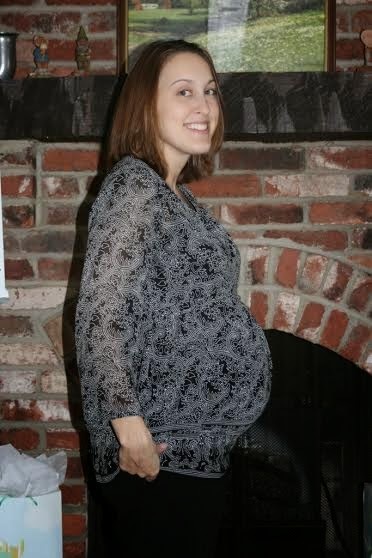 My pregnancy had been completely uneventful. I was certain that this was a mind over body feat that I could master. I had even told my friends that I was going to deliver him on January 29th. I may have been a bit over-confident in my mind's ability! At my 39 week appointment on January 22nd, my blood pressure was high. This prompted my OB to do an ultrasound. The ultrasound showed that all was normal, but my fluid levels were at the very low end of the normal range. My blood pressure remained elevated, so she admitted me to the hospital for observation. I was hooked up to a machine that took my blood pressure every 15 minutes. This lasted for 3 hours and never once was my blood pressure high, so they sent me home. My next appointment was January 27th. This would include a scheduled ultrasound to check my fluid levels and the baby's progress. Again my blood pressure was elevated. My fluid levels were even lower, though still technically in the normal range. But what ultimately convinced the doctor to induce was a shadow. 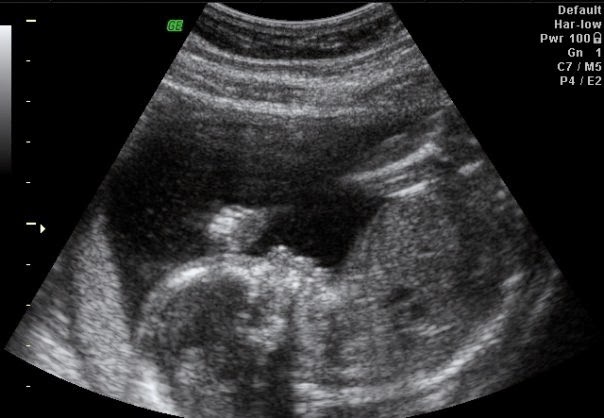 The ultrasound tech thought my placenta looked different from the sonagram done 5 days earlier. My OB didn't give me a choice. I needed to go over to the hospital immediately for an induction. It just wasn't worth the risk when I was already full term. She even apologized to me that I wouldn't get my January 29th birthday! She assured me that we would have a baby by dinner time on the 28th. The evening of the 27th, in the hospital, I was allowed to have my last meal. I choose a chicken caesar salad, which was a big mistake. It tasted terrible and I barely ate any of it. Oh how I wish I would have chosen a burger! That night was fairly uneventful. I got Cervidil to start the induction and was told to sleep, which was hard to do! The morning of the 28th I was hungry, but was told I was not allowed to eat. They checked me and said I was at 1cm. They started the Pitocin and the contractions started right up. So much more painful than I could have ever imagined. And I was confined to the bed. I was required to be hooked up to my monitors continuously. It was miserable. By noon I was exhausted, starving, and only at 3cm. My OB gave me an option - I could stop right now, go home, and come back the next day to try the induction again or she could break my water. We didn't know what to choose, so she went ahead and broke my water. That made the contractions right on top of each other and unbearably painful. By 3pm I was only dilated to 4cm and I didn't think I could take anymore. And it was clear I wasn't going to have a baby by dinner time! I very reluctantly accepted the epidural. After the epidural, I drifted in and out of sleep for a while. Around midnight was when they told me I was fully dilated and needed to start pushing. 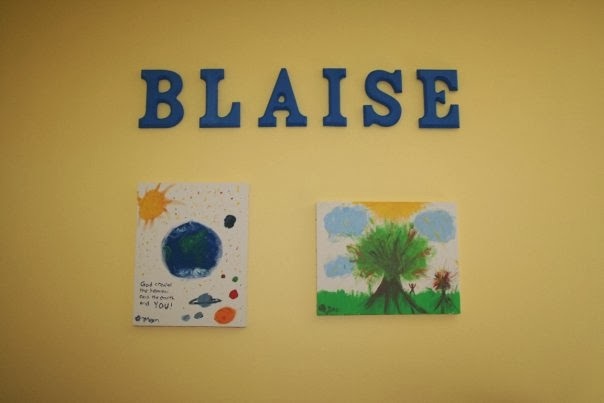 Blaise would be born on the 29th after all! I was so thankful that I was nearly done. Except, I wasn't nearly done. I was so exhausted and hungry. I tried to push when they told me to, but I couldn't feel anything. After 2 hours of pushing, Blaise hadn't moved down at all. He was sunny side up and stuck. The on-call doctor mentioned considering a c-section. I was completely opposed. I had already given up my desires for a natural birth, I certainly didn't want a surgical birth! He gave me another hour to try pushing. Still nothing. He opted for vacuum extraction. It took not one, but two tries and Blaise was out. I sustained a 4th degree tear. (That's the worst you can have - don't google it!). He spent the next hour putting in hundreds and hundreds of stitches in me. 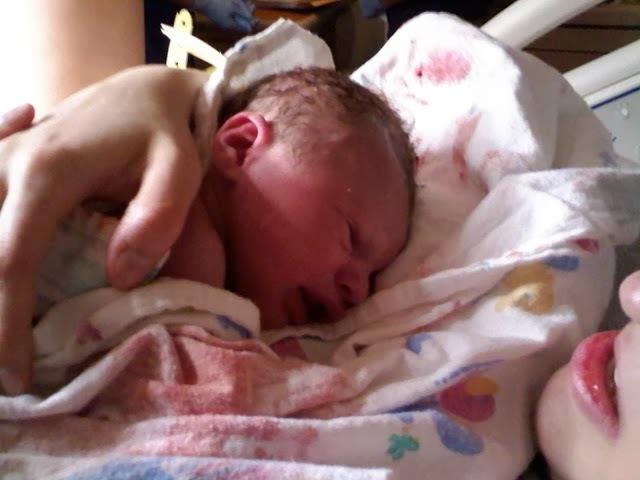 This was not anything like the birth I had imagined and planned for, but at least I was able to hold my baby right away. Usually when people share birth stories they are happy. 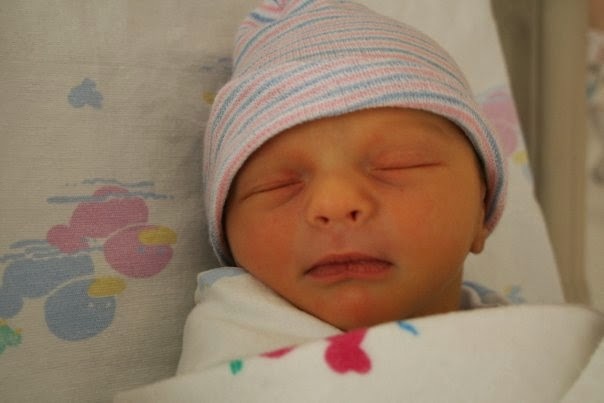 And I guess this one is too, because my beautiful little Blaise was born. 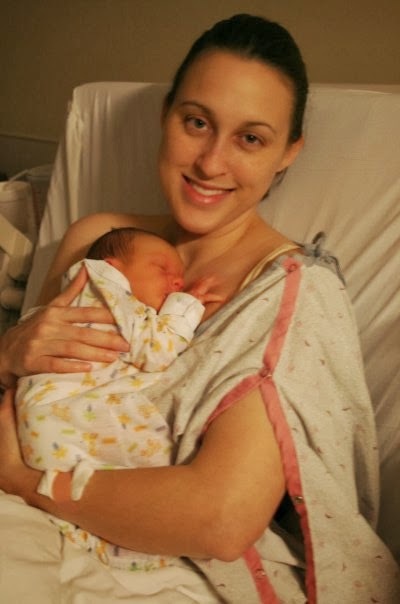 Though my body let me down in the delivery, it provided excellently in both pregnancy and breastfeeding. And for that I am thankful. Enjoy some picture of my first born and I'll be back later this week with my equally uninspiring birth stories for Finn and Lucy!